Based on the narrative of the squirrel council, the acorn play structures are unique and whimsical elements in the park that make it a true destination. The different orientations of the forms provide a range of play opportunities. They are integrated with steppers, net climbers and slides. This area also features leaf seating structures as an informal gathering area. Additional benches and planting around the play area provide comfortable seating for caregivers. The Beaver Area features two large climbing structures, including the beaver nest. The multiple opportunities for climbing, hanging and balancing provide an ideal space for kids to push themselves and test their limits. Two nearby planted berms provide shaded unprogrammed space for relaxing or play. 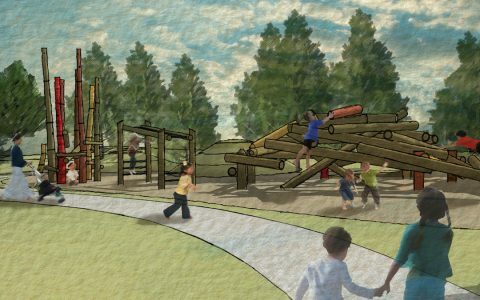 The sand play area provides space for quieter passive and imaginative play opportunities, especially for younger children. Colourful play posts are a focal point; log edging and boulders define the space and provide informal seating. The arbour over the pathway engages passersby and features sheltered benches for comfortable seating. 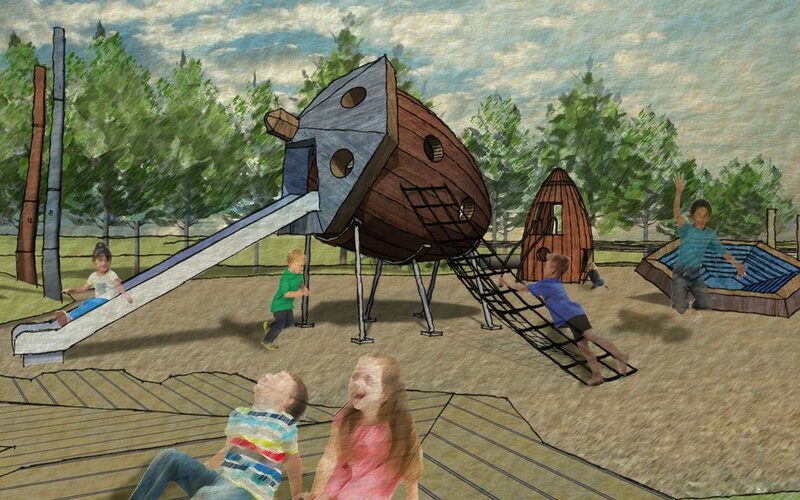 The stumps and swings area feature engraved bear prints running across the features. A custom crow bench also reflects the cultural history of the site and anchor this gathering space. Custom site amentities and small details are incorporated into the site to reflect the theme and immerse visitors in the cultural history of the regions while providing a variety of play opportunities for children.